I went to Pirate Camp and came back with all these O.P.I.N.I.O.N.S., or: Who Deserves a Place in “The Dream”? Over the last weekend, rather than go to a local event where the Crown would be in attendance and I’d get to see most of my usual peeps, I went rogue. I had previously accepted an invitation from one of my students to camp with his pirate household at Seadog Nights, a non-SCA weekend-long “immersion” event. I’ll be honest, I went based on his promise of snacks and a kiddie pool. It was actually a really cool experience to go hang out with new people, and to get to leave my SCA reputation at the door and just see things through the eyes of an outsider. I did in fact eat epic snacks and spent the hottest part of the day totally submerged (and mostly naked) in a pool (there were no kids, just adults! just to clarify!) and it was amazing. I also bought an elf fanny pack. No shame. 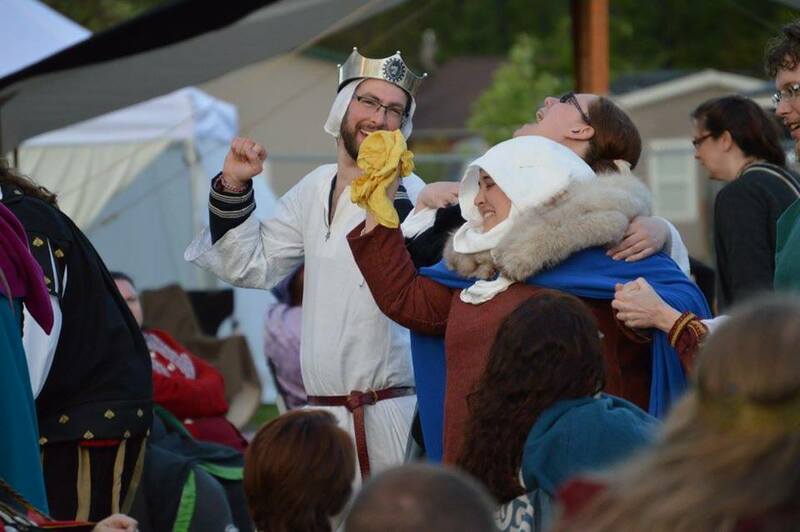 While there, I naturally found myself comparing the experience to an SCA event. For example, not surprisingly the attendees trended much younger than the typical SCA crowd, and the clothing trended more toward fantasy (including steampunk) than historical. There were also some similarities, like the idea of households and the overall concept of creating an experience somehow outside of everyday modern life. But these aren’t the comparisons I want to talk about. The comparisons I want to talk about are quite a bit heavier. Y’all, it’s time to unpack some privilege. Within about the first hour of being on site, I had seen more people of color, “visibly queer” people, and trans and gender nonconforming people than I have seen in the last 15 years in the SCA combined. I sat with that thought smoldering all weekend, and it ignited my activist nature. Although I am a white person, I do not tend to spend my time in majority-white spaces. 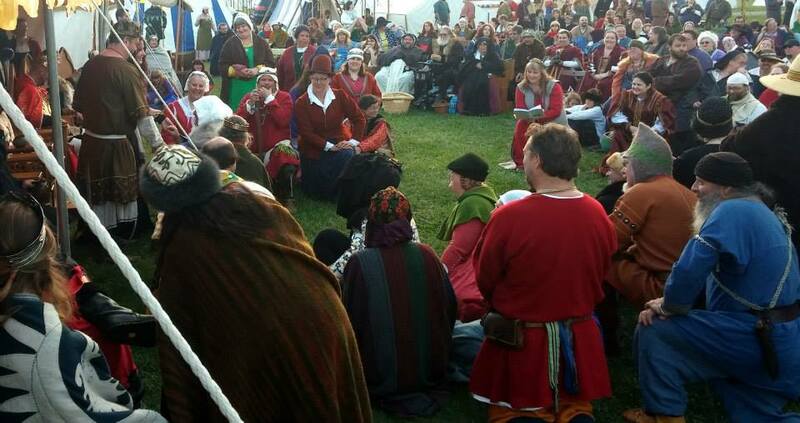 The SCA is by far the whitest part of my life, and that has never sat well with me. I am an anti-racist activist, and when I see that an organization I am a part of is not appealing to people of color, I notice that and figure out what I can do to change it. The fact that PoC are participating in something that is broadly similar to the SCA was a wake-up call to me: what are the pirates doing right that we aren’t? I’m not sure I have a good answer to that, and while I have a few ideas I don’t think I’m versed enough in “pirate culture” to be able to say for sure. It’s also hard for me to sort out what the SCA is doing “wrong” since my own white privilege prevents me from seeing our organizational blind spots. Because I am white, it is not appropriate for me to speak for the PoC experience; I can say that I have personally heard some really disheartening stories from PoC about the SCA and other historical reenactment groups. For me it’s enough to know that there are PoC who are drawn to things very much like the SCA, but who are not choosing the SCA; that’s worth fixing. I suspect that the knee-jerk reaction to all that is to try to deny that we have a problem, or to find reasons to explain away the lack of PoC participation in the SCA; again, though, that perspective comes from a place of privilege — as white people, it’s too easy to for us to accept mostly white (or all white) spaces as normal and acceptable. Similarly, it’s easy for straight and cisgender people to accept heteronormative institutions. And oh, the SCA has some deeply entrenched heteronormative and trans-exclusionary norms. I am queer, and a cisgender pro-trans activist. Queer and trans people are a normal part of the fabric of my social life. Again, while I can’t speak to the trans experience, I have personally observed trans-exclusionary attitudes on full display in the SCA. Our language as an organization is highly gendered — we are all lords or ladies — and our concepts of chivalry rely heavily on very specific gender expectations; all of this leads to an environment where trans, nonbinary, agender, and gender nonconforming people are left out. I can definitely speak to what it feels like to be a queer person in the SCA. It took me much longer to come out in the SCA than in any other context, and I’m not even sure I can explain why, just that it felt a lot harder to be gay in the SCA than to be gay in the rest of my life. Those same institutionalized gender expectations and gendered language mentioned above also marginalize queer people. Just look at the fight over Inspirational Equality — that Corpora used gendered language from the get-go shows that at the founding of this organization, not one person considered a queer or trans perspective. We had to ask for a seat at the table after the fact. And then when we asked for the rules to be changed to allow us to participate as equals, we were met with bitter resistance. In spite of the fact we do not actually have any explicit requirement for historical accuracy and we state that we are about recreating history “as it should have been,” suddenly people got really riled up about “authenticity” as a reason to exclude same-gender consorts. Yet I’m pretty sure I can actually make a much better historical case for queer monarchs than for monarchs chosen by rattan-sword combat. That leads nicely to what I see as the way forward: we can choose which aspects of history we celebrate and look to for inspiration, and it’s time for us to align to a more diverse image of the past. The truth is, we have always been here. History was not white, cisgender, and straight. Even if we maintain the Eurocentric focus of the SCA, black and brown people absolutely lived in Europe during the medieval and renaissance periods. Are our images of the Middle Ages based more in reality, or in 19th and 20th century fantasy? There are numerous accounts of queer sexuality during our time period of study, and of people whom we would probably now describe as trans. Are we celebrating these stories? Through what lenses are we interpreting the past, and what do those lenses prevent us from seeing? Are we recreating the past, or are we recreating an idealized “past” as imagined by (mostly or all white and straight) college kids in 1966? Perhaps you think I shouldn’t bring “modern politics” or “political correctness” into your dress up game. For marginalized groups, the personal is inherently political. White, cisgender, and heterosexual are not apolitical default options. If the idea of doing some work to make sure everyone feels welcome in our game bothers you, I would like to encourage you to sit with that discomfort and really examine it before reacting. The reality is, we make choices in reenactment; we pick and choose which parts of the past we will bring into the present. It’s time for us to choose inclusion. We say that we are rooted in “The Dream” — but whose dream is it, and who gets to take part? As a Laurel, one of my responsibilities is to promote research and authenticity. I see now that I can use that as a pathway toward strengthening the Dream. I commit to seek out information about people of color, queer people, and trans people in medieval and renaissance Europe (ignoring for now the bigger problem of Eurocentrism) and to find ways to celebrate and publicize these stories. If you take only one thing from this rambling post, let it be this: queer, trans, black, and brown people lived in the same past that we say we are recreating — if ANYONE tries to use “authenticity” to justify bigotry or exclusion, you have my permission to say, as loudly as you can: ACTUALLY, THAT’S A COMMON MISCONCEPTION! You don’t have to be a Tumblr-discourse-certified SJW to be an ally, you actually just have to be a history lover. Use gender-neutral language. “Good gentle” as opposed to “My lord / my lady,” “the Coronets” instead of “Baron and Baroness”, etc. Unpack your own privilege; there are lots of resources online to help you do this. Author eulaliaPosted on July 24, 2017 July 24, 2017 Categories SCA cultureTags anti-racist, historical reenactment, my thoughts, people of color in medieval europe, pirates, queer history, queer positive, rambling, SCA culture, the sca is so white, trans history, trans positive21 Comments on I went to Pirate Camp and came back with all these O.P.I.N.I.O.N.S., or: Who Deserves a Place in “The Dream”? I’ve had a lot to chew on since May Crown. The whole experience of the offer, the lead up, the vigil, and the elevation ceremony has been incredible. I’ve gained a much deeper appreciation for the Society and what it means to me, and come to see my place in it with much more clarity. I wanted to share a few of my thoughts here. One: It’s not about me anymore. The night after my offer, I didn’t sleep a wink. I lay awake feeling “all the feels” and ruminating on what it all meant. Around sunrise, I left the tent (and my sweet snoring wife) and took the dog for a long walk. I looked around at all the tents, the banners, the physical trappings of this game that I love, and a that’s the thought that crystallized: It’s not about me. Being offered Peerage is about the people who believe in me, and being a Laurel will primarily be about building others up and making the Kingdom and the Society better. This shift from self to others exhilarates me. I love teaching, and mentoring, and talking about awesome people. My post-Laurel life is going to be amazing! Two: I am enough. I am one of those people who believes that the relationships I have and the kindness other people give me is always conditional; I don’t really deserve friendship but can earn it if I work hard enough. I’m working on that. But the entire experience of being elevated was to realize that there are people in my life who like me for me. I felt like I floated into Court, buoyed by love. I will still strive to be a kind person, to live my life with honor, and to return the love that is given to me, obviously, but I don’t feel the same sense that I have to perform to gain friends; the doubting voice that snipes on me is a little quieter now, and that’s a good thing. 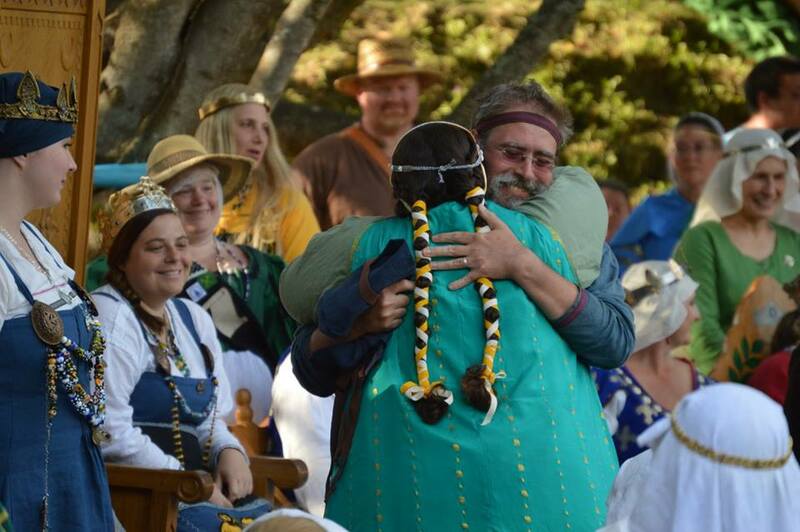 My master, Refr, releasing me from fealty with a hug. Photo by Lisa Morello. Three: Everyone’s path is different. I joined the SCA at 17, blossoming from an awkward teenager into an awk-dorable (so awkward it’s adorable) adult. Now I’m just shy of 15 years in the Society — college and grad school and work challenges have meant the SCA has been on the back burner many times, too. I have known people who were made Laurels faster or younger, and others who took a longer way around. I kinda always knew I wanted to be a Laurel, and I always knew why I wanted to be one: I wanted to feel like I had mastered a chosen art form, know that I was a research expert, be able to shape the Society in a larger way, and have the opportunity and encouragement to have students and apprentices. 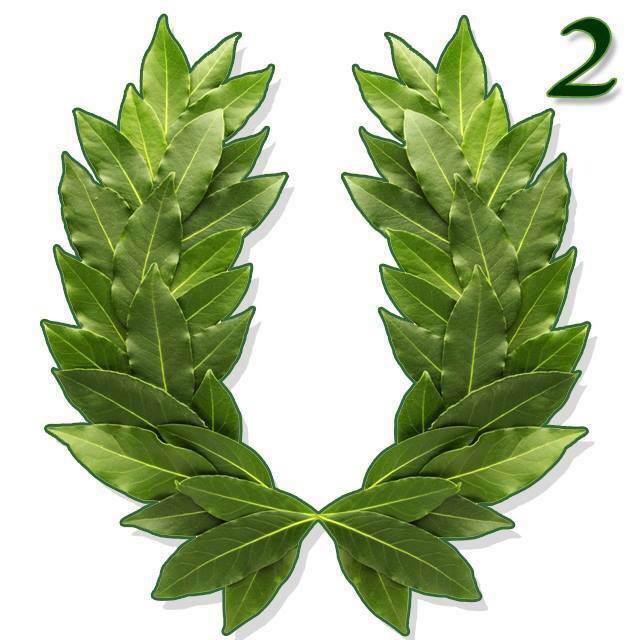 I also knew that wanting to be a Laurel was not the same as desperately pursuing the “cookie” of getting a Laurel. (You don’t get a Laurel, you are a Laurel; it’s a job, not an award.) It was important to me that my pursuit of this goal take the form of always working to make myself better. I did a huge amount of soul-searching over these last few years and I really did work on becoming my best self and learning to reflect the best parts of the SCA’s shared values. However, it was also very important to me that I never lose sight of who I am, and that I not sell my personality short or ever let myself get caught up in some mythical “things I should do so I’ll be a Laurel” checklist. 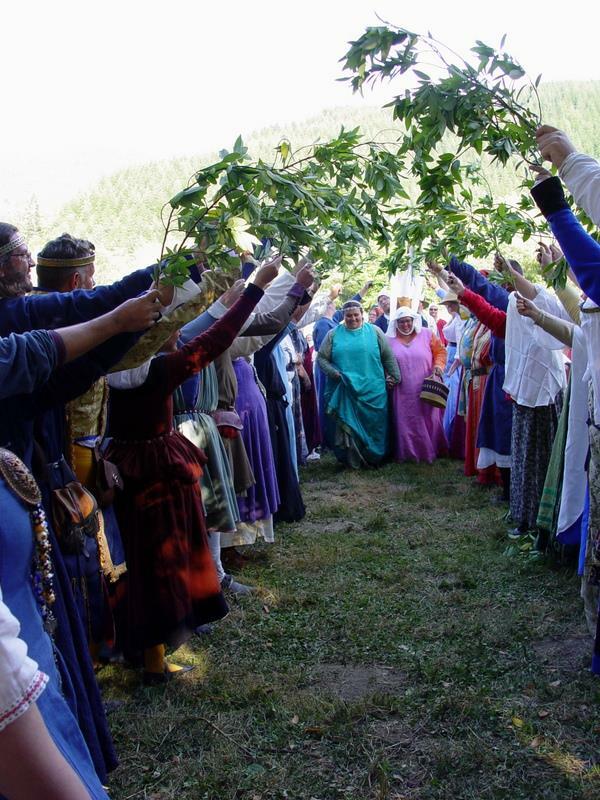 I don’t mean PLQs, I mean, like, “If I cook twenty feasts, they’ll HAVE to make me a Laurel!” Don’t do that. Just don’t. While looking at the characteristics that Peers have in common and looking for ways to emulate those characteristics can be a powerful exercise, don’t get bogged down in comparing your journey to others (including me!) There is no such thing as the way to become a Laurel, or a standard timeline, or any of that, because it’s hugely individual. The Laurels present made an arbor of laurel branches to welcome me (and my Lady) into Court. Photo by Sandra Linehan. Four: Be you. I am just a big, enthusiastic dweeb. I am like a golden retriever: I am excited about everything, I love everyone, life is so great, and I can’t really contain my (metaphorical) tail-wagging. And you know what? That’s okay. That zany, goofy, loving part of me is exactly WHY I’m able to research my interests with unwavering passion, and why I’m able to pontificate profusely on pies. Being a golden retriever of love has also been the driving force behind meeting people in the SCA, and those people I’ve met pushed me to get better and taught me incredible things — the genuine connections I’ve made with people are what got me here. 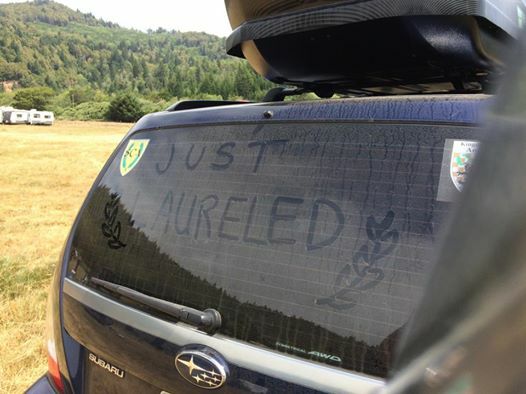 This part of me is not going away now that I’m a Laurel (sorry not sorry!) Passion is what drives me, and while many (most? some?) Laurels are a little more serious than I am, they are all deeply passionate. Don’t be afraid to let your passionate dweeb flag fly. My baron, my apprentice sister, and myself (and a crowd of Laurels and friends!) walking out of Court after my offer. I am crying so hard in this picture, and laughing so hard too. I wish I could bottle how I felt in this moment and open it for a little taste every so often. I can no longer find the name of the photographer. Five: This is a big deal to me, and I think that’s okay. The SCA is a huge part of my life. Becoming a Peer is deeply meaningful to me. I find that I’m having a hard time articulating the experience and the meaning to non-SCAdians, actually. I’ve mostly defaulted to saying that I’ve been given a big recognition for my research and cooking/art, or to comparing it to (modern mundane) knighthood. I’m also struggling within the SCA, too: I feel like talking about what a big deal this is to me will come across as bragging, like I’m saying that I’M a big deal, but that’s not it at all. This is something that I honestly dreamed about, and having a dream come true is AWESOME. Even the way it all played out, like getting to have my vigil and ceremony at An Tir / West War with the Cooks’ Playdate folks was dreamy. I just feel so blessed and so happy, and I’m looking forward to what comes next. I feel like I was climbing a mountain, pushing myself harder and harder until I finally tipped over the summit, and when I did I discovered that there’s not just the top of the mountain, it’s like a huge plateau, and there’s a whole new world up here that I get to explore! Maybe I’ll even find new mountains to climb! It’s cliche, but my elevation doesn’t feel like a culmination but a commencement. My car after War. It was hard to bring myself to get it washed! This has been quite an adventure, and I can’t wait to see where it takes me next.